Benjamin Bernanke preached Corporatism before the masses. He also showed them how to walk-on-beer, transform air into lead, and turn peace into war. MOE’S K-STREET BAR, Washington, D.C. -- In a bold move of Biblical proportions the FED’s normally reserved chairman, Benjamin Bernanke, warned the growing Occupy Movement and all other opponents of the FED that they will face the same fate Jesus and JFK did if they don’t cool it. He then proceeded to tell an old story, among other ramblings. An UnNews presstitute, anxious for the big scoop, disguised himself as a bartender and listened to Bernanke’s warning. The FED chairman directly threatened all members of the Occupy Wall Street group, who oppose the privately owned FRAUD ENABLED DOLLAR (FED) banking cartel, and said he looked forward to giving them the same punishment meted out to John F. Kennedy and Jesus. Both men had challenged the banking cartel and were killed for their fruitless efforts. “You people think that Jesus died for your sins?” Bernanke mocked. “Well, if he did then whattya-gotta worry about?” He downed another beer as he elaborated, “The truth is that Jesus was plugged because he opposed us Bankers. 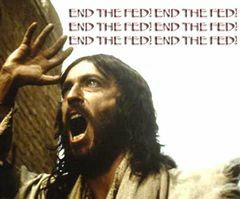 He wanted to end the FED, just like you Idiatz! Jesus was the original Occupy protester. “Jesus and Kennedy were no problem to us as long as they just walked on water, transformed fish into cheap wine, healed the healthy, and signed autographs for the hanger-ons” Bernanke pointed out. “But the whole Jesus and JFK problem took on a whole new light when they transformed themselves into trouble-makers and started to mess with us. Everyone in the bar looked at him like he was a nut-job conspiracy theorist. He didn't seem to know that Lee Harvey whats-his-name was a lone gunman with THREE magic bullets, because Ben tried to convince us to believe his lone magic bullet claim. “Listen, if the FED can turn plain old air into new money, sheeesh!, don’t you think we can make a magic bullet?” Ben asked with an incredulous look on his face and beer foam dripping from his upper lip. “You don’t believe me? Well, then let me tell you the believable part. 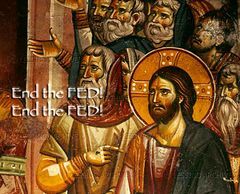 Jesus attacks ancient Central Bankers. At this point Ben was getting pretty worked up. 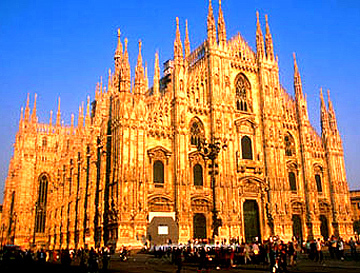 “After Jesus left the FED in a shambles the bankers all ganged together and squealed on him. Pontius Pilate was the Man back then. So we told him what happened and demanded that he kill Jesus and make an example of him for future generations – such as you Occupy clowns! The FEDs rat on Jesus to the Feds. “Well, Christ! That was an easy decision to make. So they took Jesus away and crucified him,” Bernanke said with a menacing look. “And you know what?” -- “No, what?” the bar patrons asked. Ben smiled devilishly and said “Jesus died for nothing! Nothing! Because in spite of his violent opposition to the money-changers in the Temple he failed miserably, and banking didn't slow down or diminish one iota! “So I’m warning you hippies! 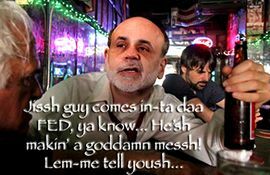 Don’t mess with the FED, or you’ll be next to get whacked!” Bernanke slurred, before demanding another free beer. After hearing this dire threat this UnNews repeater was in awe and quickly left the bar while I still had a chance. Now, here I am, bringing the same warning to you lucky UnNews readers. 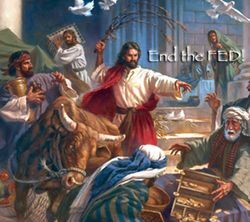 Here's the result of Jesus’ campaign against the FED.